The 2016 Chrysler 200 may be the automaker's best midsize sedan on the market, and for those buyers who seek a state-of-the-art sedan that pushes the limits of what a car can do, this is the vehicle to see. The Chrysler 200 delivers a sporty and aggressive exterior design, a roomy interior and offers enough powertrain to leave the competition scrambling to keep up. At Premier Chrysler Jeep Dodge Ram Chrysler, we carry a vast inventory of all things Chrysler, including the 2016 200 sedans. When you are ready for a test drive or to see the Chrysler in person, we are located in New Orleans, LA and serve car-buyers from the Metairie, Kenner, and Slidell areas. Our team of customer service experts are waiting to meet your needs. If you are the type of person that enjoys driving; if excellent performance and handling get you excited; the 2016 Chrysler 200 will not disappoint. The sedan is perfect for testing the limits of the road, weaving in and out of traffic or even for taking a leisurely Sunday drive along an empty highway. The 200 is equipped to do whatever you want. The five-passenger midsize sedan is available in four trims: LX, Limited, S and C. The base level model starts off with a 2.4-liter four-cylinder engine with 184 horsepower and 173 pound-feet of torque. The upper-level trims offer an option for a 3.6-liter, V6 engine with a nine-speed transmission and the ability to produce 295 horsepower and 262 lb-feet of torque. Either engine you decide on will one of the smoothest rides in it's the midsize sedan segment. 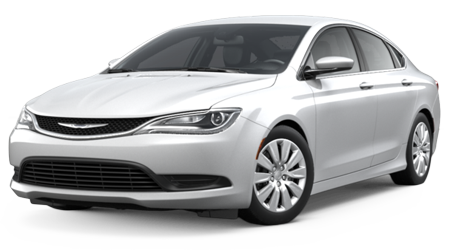 Amenities wise, the Chrysler 200 LX comes with 17-inch wheels, remote start and entry, a four-speaker sound system, cruise control and automatic headlights. Each trim only improves from there to offer the craftsmanship buyers might be looking for out of the Chrysler. Here is a quick look at a few of the 200s performance specifications. The Chrysler 200's interior design with a modernized cabin continues to be one of the sedan's drawing points. The dashboard is sleek and upscale while seamlessly intergrading advanced technology with its 8.4-inch infotainment Uconnet system. Drivers can easily connect their smartphone's to the sedans interface with Bluetooth, USB, and wireless hands-free capabilities. Cabin wise, both the front and back passenger seating provide ample space and firm seats made with fine cloth materials and a panoramic sunroof (in the upgraded trims). Overall the Chrysler 200s interior was built to please, and this version of the vehicle is sure to score huge points with drivers. If you are a driver who loves to be out on the road, the 2016 Chrysler 200 is a sedan with enough power and handling to keep up with your active lifestyle. The vehicle drives like a dream, offers a spacious and inviting interior, and will turn heads when out on the road. At Premier Chrysler Jeep Dodge Ram we want nothing more than to get you in the right version of the Chrysler 200 at the right price. Visit us in New Orleans, where we serve buyers from the Metairie, Kenner, and Slidell. Located at 13000 I-10 Service Rd, New Orleans, LA 70128, our knowledgeable team Chrysler representatives are ready and waiting to help meet your every car-buying need.